If you are a blogger and looking for a good book to read, then this one is for you. 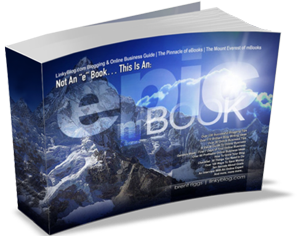 I got a free ecopy of Brent Riggs new book: The Epic Book Guide to Blogging and Online Business. I am not done reading all the chapters yet but I absolutely love this book. Brent tackled every single aspect of online business with precise explanation. Now for another exciting news and with his permission, I am giving away 5 ecopies to my friends and followers. Enter the giveaway below to win an ecopy. Open Worldwide, 18+. Goodluck! I have been considering starting my own blog and would LOVE to have a tool that would prove useful in each step of this process. I have been thinking ALOT about starting my own blog, but not real sure where to start. It's wonderful that someone actually put it all together in one place!! This is a must have book to bloggers. Good thing it has an ebook version, I can read it on the go. I would like to read that book, there are so many things that I still have to learn about blogging. I watched the video on the side of your blog, so funny. I would love to have a tool to become a better blogger. Sounds like a great book to read and earn some things on how to earn some money online. That would be wonderful! Thanks for sharing this one. Entered. Wow! this book must be a golden book for us bloggers :) i'm sure all the information that we need to know is in that book from how to start blogging to how to generate income from our websites. This is nice book to own would help business boost! I think this book is perfect for us bloggers who want to earn money online. This could very helpful and good investment as well. That must be a good read and a book that I need to read to become more a more effective blogger :-) Thanks for sharing. I would like to have that book. This is my chance to have a progress when it comes to blogging specially that I am a newbie. this is a must book for those newbie bloggers and planning to get into business selling goods in the internet. I've been blogging before, but it was just for the reason of venting out my frustrations. I never even really cared if I have a reader or none, as long as I write. But now I'm really hungry for traffic (and attention? hahaha). I'd love to see what's inside the book, i know it can help me become a better blogger. This would be nice to read!